The fallout just keeps on falling from the recent NFL-to-LA meetings. The Rams are, of course, gone to LA, infuriating everyone in St. Louis and swearing those folks off of the NFL for all time. Meanwhile, the franchises that were the two “losers” in the decision-making have been forced to make decisions of their own and come up with some alternative plan to what they originally proposed (which was sharing a stadium in Carson). So there has been news this week. 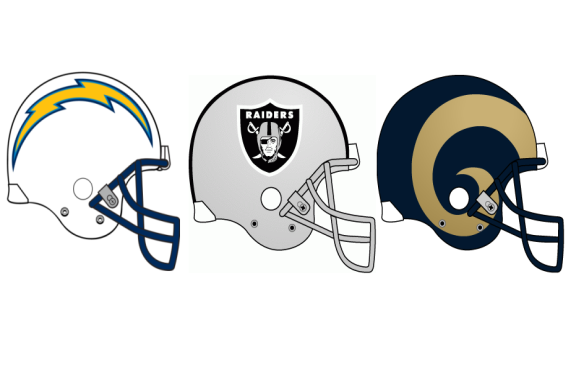 First is the San Diego Chargers announced they are staying put, at least for 2016. They are going to try one more time to get a deal done with San Diego, and if it doesn’t work this time, they get to blame the idiots at City Hall for forcing them to move to LA. This kind of reminds me of how the city of Winnipeg managed to get an extra season out of the NHL Jets in 1995-96 when it looked like they were definitely gone the year before. Anyway, we shall see what happens. As well, the Oakland Raiders continue to get nowhere in attempts to stay in Oakland, so they have been looking around. The big rumor this week was that owner Mark Davis was talking to Sheldon Adelson about moving into that domed stadium project being built for UNLV. The Las Vegas Raiders. It sounds good to a lot of people. I don’t question Las Vegas would support the Raiders if they came, it would be fantastic for the city. I simply think hell will freeze over before the NFL will let it happen. I still think Las Vegas is a far better bet for an NHL expansion team. For one thing, the NHL owners simply don’t care about the gambling in Las Vegas, and furthermore the gamblers absolutely don’t care about the NHL (ha ha ha). Speaking of which, this has got to be among the deadest weekends for sports for all time, with the NFL taking the weekend off (the Pro Bowl doesn’t count) and with the farce that is NHL All-Star Weekend upon us, attempting to fill this black hole of a sports void. And NASCAR has yet to start. Thank goodness for the Rolex 24, though, otherwise there will be nothing for sports fans to watch!